This free, printable business plan identifies strengths, weaknesses and competitive edges for educators and school owners who provide child care services. 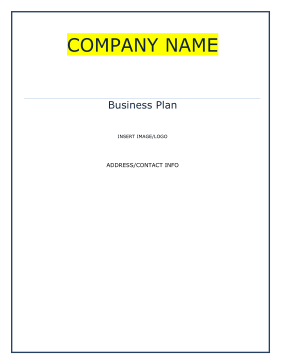 Introduction: COMPANY NAME is a start-up managed by OWNER'S NAME. She has several years in extensive experience in the child care industry, and has maintained excellent reputations in this same industry. In addition, OWNER'S NAME is capable of handling the sales/management and finance/administration areas, respectively. Company/Service: COMPANY NAME, a start-up company, is a mid-size child care facility serves children from 6 weeks to ten years of age. Services includes teaching tools to prepare the children for the public school systems, provide a safe and secure environment, and providing the parents with an excellent place where their children can be taken care of. COMPANY NAME will succeed by offering its clients' children a safe and secure care environment, and close personal attention. The goals of the center are dual-sided: to help parents feel good about the care of their children, and to make it a safe, educational, and fun experience for the child. COMPANY NAME's competitive edge is the facility's effort in obtaining all appropriate licensing and certifications. Additionally, thorough pre-hire background screenings are performed on all individuals before hired for employment. Financial Considerations: The current financial plan for COMPANY NAME is to obtain grant funding in the amount of $300,000. The grant will be used to purchase and build-out a child day care facility. • To create a service based operation whose primary goal is to exceed customer's expectations. COMPANY NAME is a start-up managed by OWNER'S NAME. She has several years in extensive experience in the child care industry, and has maintained excellent reputations in this same industry. In addition, OWNER'S NAME is capable of handling the sales/management and finance/administration areas, respectively.